Supercharging a Coyote-powered Mustang for a potent payoff on the street and the chassis dyno. 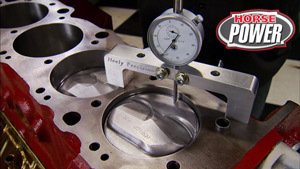 Family-owned and operated machine shop repairs cylinder heads, engines and motors; performance work and dyno testing available. (JOE)>> WHEN A FORD GUY WITH AN ITCH FOR PERFORMANCE BUYS A NEW MUSTANG GT, HE CAN NEVER LEAVE IT ALONE. COYOTE TO OVER 550 HORSES. AFTER DOING OUR RESEARCH WE CAME UP WITH THIS SYSTEM FROM PAXTON THAT INCLUDES AN NOVI 2,200 SL CENTRIFUGAL BLOWER WITH OUR SETUP IT'LL PRODUCE FROM SEVEN AND A HALF TO EIGHT AND A HALF POUNDS OF BOOST. IT'S GONNA HANG ON BILLET AND STEEL BRACKETRY. THE KIT COMES WITH NEW INJECTORS, FUEL RAIL SPACERS, AND THIS EASY TO USE SCT POWER PROGRAMMER. WE'RE ALSO ADDING A PAXTON AIR TO AIR CHARGE COOLER THAT COMES WITH ALL THE PLUMBING YOU NEED. AND TO COMPLIMENT ALL THAT POWER WE'VE GOT COMPONENTS TO ENHANCE THE HANDLING AND BREAKING OF THE MUSTANG. INSIDE THE CABIN YOU DIDN'T GET ENOUGH OF THAT VEIGHT SOUND. NOW THE OWNER REMOVED IT BECAUSE HE HEARD A SLIGHT WHISTLE. (JOE)>> SO OUR NEXT STEPS ARE REMOVING THE DRIVER AND PASSENGER SIDE PCV HOSES. PULLING AWAY AT THE AIR DUCT INLET, WHICH WILL NOT BE REUSED, FOLLOWED BY THE AIR BOX WHICH WILL BE REUSED. NOW WE'RE ALSO GONNA KEEP THE COLD AIR SNORKEL. THEN AFTER DRAINING THE RADIATOR INTO A CLEAN CONTAINER WE CAN REMOVE ALL THE COOLANT HOSES. BE SURE TO KEEP THE UPPER HOSE FOR MODIFICATION AND REUSE. NEXT TO GO THE FAN'S ELECTRICAL CONNECTOR AND THE FAN. 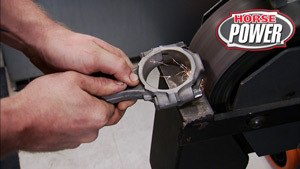 AFTER ROTATING THE BELT TENSIONER, REMOVE AND SAY GOODBYE TO THE STOCK DRIVE BELT. NOW WE CAN CAREFULLY REMOVE THE MAP SENSOR FROM THE AIR BOX. UNPLUG THE THROTTLE BODY ELECTRIC CONNECTION AND REMOVED THE THROTTLE BODY. 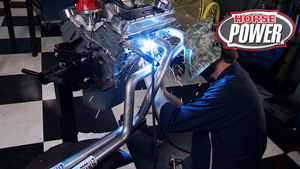 WITH THE THROTTLE BODY INLET COVERED, WE CAN CUT THE OEM CLAMP ON THIS HOSE THAT'S ATTACHED TO THE "Y" ON THE WATER NECK. RECLAMP IT WITH A WORM GEAR HOSE FROM THE KIT, ORIENTED SO THE SCREWS ARE TO THE DRIVER'S SIDE. WITH STEPLESS CLAMPS. MAKE A COUPLE MORE HOSE MODIFICATIONS TO GET ALL THE COOLANT PASSAGES BACK TO THE RESERVOIR. (JOE)>> NEXT WE PLACE THIS WIDE AIR DAM INTO POSITION IN EACH CORNER OF THE FAN SHROUD. AIR DAMS AND ALL THESE MODIFICATIONS WE'VE MADE HERE IN FRONT OF THE ENGINE ARE ABOUT CREATING SPACE AND WE'RE GONNA FILL THAT SPACE WITH THE HEART OF OUR SUPERCHARGER SYSTEM NEXT. 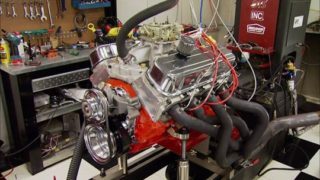 (JOE)>> IT'S ABOUT TIME FOR THE MAIN EVENT OF OUR FIVE LITER MUSTANG PROJECT, A PAXTON SUPERCHARGER THAT MOUNTS ON A SUPER STRONG BILLET ALUMINUM AND STEEL BRACKET. WE FIRST INSTALL TWO STUDS ON THE FRONT COVER, AND SLIDE SPACERS OVER THE TWO STUDS. THEN SLIDE THE MOUNTING BRACKET ASSEMBLY OVER THE STUDS WITH A THIN PLATE TOWARD THE ENGINE. NOW WE SECURE THE STUDS WITH A FLAT WASHER AND NUT, BUT WE DON'T TIGHTEN THEM YET. USING MORE SPACERS AND HARDWARE, WE SECURE THE BRACKETRY TO THE ENGINE. (JOHN)>> YEP, WE'RE BUTTED UP. WE TIGHTEN IN AN ALTERNATING SEQUENCE. (JOHN)>> MOUNTING BRACKET IS IN. THAT FEATURES AN INTERNAL OIL RESERVOIR FOR SELF CONTAINED LUBRICATION. RUNNING FROM THE ENGINE TO THE ACTUAL COMPRESSOR HOUSING. NOW IT ALSO HAS INTEGRATED GEAR CASE BAFFLING FOR PROPER OIL CONTROL. IT COMES WITH A THREE POINT EIGHT INCH PULLEY TO GIVE US SEVEN AND A HALF TO EIGHT AND A HALF POUNDS OF BOOST. 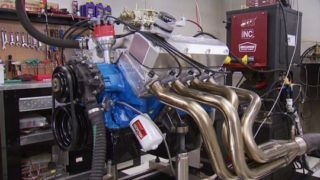 NOW THIS SAME UNIT IS USED IN THE TUNER KITS TO PRODUCE UP TO 1,000 HORSEPOWER. YOU DO HAVE TO CHANGE THE OIL IN THESE THINGS, AND THIS IS THE DRAIN LINE FOR IT AS WELL AS A FILL PLUG THAT DOUBLES AS YOUR OIL LEVEL CHECKER. NOW LOWER THE CHARGER INTO THE CRADLE OF THE OUTER MOUNTING PLATE AND TIGHTEN IT WITH FIVE FASTENERS. I'M JUST GONNA ZIP TIE RIGHT THERE. 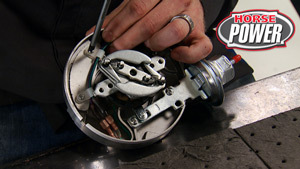 (MIKE)>> REMOVE THE WATER PUMP PULLEY, AND REPLACE IT WITH THE ONE FROM THE KIT. NOW WE CAN ROUTE THE BELT MAKING SURE TO FOLLOW THE DIAGRAM AND THE PAXTON BOOKLET. MAKING SURE THE ORINGS STAY IN PLACE, AND RECONNECT THE ELECTRICAL CONNECTOR. SOME EXCESSIVE CRANK CASE PRESSURE. THE THING IS IF WE START SUCKING OIL THROUGH THERE, ALL WE'RE GONNA DO IS WET DOWN OUR BLOWER, MESS WITH OUR AIR/FUEL RATIOS, AND TAKE AWAY HORSEPOWER. SO WE'RE ADDING THIS OIL SEPARATOR KIT FROM JLT PERFORMANCE. NOW WHAT THIS WILL DO WILL FILTER THE VAPORS ON THROUGH TO THE INTAKE AND ALLOW THE EXCESS OIL TO GET CAUGHT IN THIS REMOVABLE BASE. IT INSTALLS FROM THE INTAKE RIGHT BEHIND THE THROTTLE BODY AND ATTACHES TO THE ORIGINAL PCV VALVE. (MIKE)>> THE HORNS HAVE TO BE REPOSITIONED NEXT TO MAKE WAY FOR THE CHARGED COOLER PIPING, BY FIRST REMOVING THE HORN ASSEMBLY, REMOVING THE BRACKET, ROTATING IT 180 DEGREES. THEN WE CAN REMOUNT THE HORNS NOW JUST A LITTLE HIGHER THAN BEFORE. BY THE WAY HERE'S HOW THE CHARGED COLOR SYSTEM GETS POSITIONED IN THE CAR WITH ALL THE PIPING AND SILICONE COUPLERS. LETS SEE HOW WELL IT FITS UNDER THE HOOD. ALL THE TIME AND ENERGY SPENT ON MAKING ROOM FOR THIS SYSTEM HAS REALLY PAID OFF. EVERYTHING WE'RE INSTALLING HAS JUST ENOUGH ROOM TO PACK IT IN. YOU HAVE TO ADMIRE THE ENGINEERS WHO FIGURED THIS ONE OUT. FINALLY WE NEED A VACUUM LIKE FROM THE BYPASS VALVE TAPPED ONTO OUR BRAKE BOOSTER LINE. (JOHN)>> WITH THAT DONE, WE CAN UPGRADE OUR FUEL INJECTION, FIRST BY DISCONNECTING THE FUEL FEED LINE, REMOVING AND SETTING ASIDE THE HEATER HOSE GUIDES ALONG WITH THE FOAM INSULATION FROM EACH FUEL RAIL. THEN UNPLUGGING THE INJECTOR ELECTRICAL CONNECTORS AND LIFTING THE FUEL RAILS WITH THE INJECTORS ATTACHED. 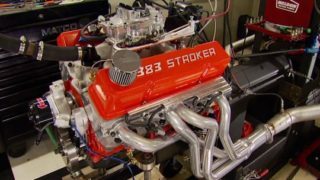 (MIKE)>> THE STOCK FIVE LITER INJECTOR IS A LITTLE BIT TALLER AND COMES IN WITH A FLOW RATE OF 32.7 POUNDS PER HOUR. THE NEW INJECTOR IS THE SAME ONE USED IN THE FACTORY GT 500'S. THE FLOW RATE ON THIS ONE IS 47 POUNDS AN HOUR. AND SINCE THEY'RE SHORTER, WE ALSO HAVE TO LOWER THE FUEL RAIL WITH THE NEW STAND OFFS FROM THE KIT. (JOHN)>> AFTER REINSTALLING THE RAIL, WE JUST REVERSE THE PREVIOUS STEPS. WE CAN NOW POUR COOLANT BACK IN THROUGH THE NEW RESERVOIR. THE ENGINE COVER WILL REQUIRE A LITTLE TRIMMING FOR CLEARANCE, THEN IT POPS BACK IN PLACE. THE AIR DUCT INLETS ON THE KIT CONNECTS TO THE SUPERCHARGER INLET USING THE SUPPLIED REDUCER. AT THIS POINT WE CAN INSTALL THE OTHER OIL SEPARATOR. THIS ONE GOES FROM THE NPT FITTING ON THE AIR DUCT TO THE VALVE COVER ON THE DRIVER'S SIDE. WITH THE NEW HIGH FLOW AIR FILTER IN PLACE, WE CAN INSTALL THE OEM AIR BOX LID. BEFORE THE FASCIA CAN GO BACK ON, IT NEEDS SOME MODIFICATIONS TO CLEAR THE CHARGER COOLER AND PIPING. THIS INVOLVES CUTTING AWAY SOME PLASTIC ON THE INSIDE, INCLUDING PORTIONS OF THE RIGHT AND LEFT FAUX VENTS. PLUS THE CENTER OF THE LOWER GRILL OPENING. THEN IT CAN GO BACK IN THE ORIGINAL LOCATION, CUSTOM CUT FOR A PERFECT FIT. (JOE)>> JUST A FEW MORE STEPS BEFORE FIRE UP, LIKE REMOVING THIS BRASS SHIPPING PLUG, AND REPLACING IT WITH A VENTED PLUG FROM THE KIT. THIS OTHER BRASS PIECE IS A DIP STICK. TO CHECK OIL LEVEL THREAD IT ALL THE WAY IN, REMOVE IT, AND THE OIL SHOULD REGISTER IN THE CROSS HATCH AREA OF THE STICK. NOW TO GET THE MOST PERFORMANCE FROM THE SUPERCHARGER, IT ONLY MAKES SENSE TO IMPROVE THE FIVEO'S EXHAUST FLOW. SO WE'RE INSTALLING AN AMERICAN THUNDER AXLE BACK KIT FROM FLOWMASTER. THE TWIN CHAMBERED MUFFLERS FEED INTO A PAIR OF POLISHED STAINLESS STEEL TIPS. FINALLY WE CAN REPROGRAM THE COMPUTER. PAXTON MAKES IT EASY WITH A SIMPLE PLUG AND PUNCH FLASH TOOL FROM THE KIT. YOU JUST FOLLOW THE PROMPTS AND THE TOOL DOES ALL THE WORK. (MIKE)>> MAN THAT THING SOUNDS AWESOME. (JOE)>> BEFORE WE CAN DRIVE IT AND DYNO IT THOUGH, WE'RE GONNA BEEF UP THE BRAKING AND HANDLING TO COMPLIMENT THE FIVEO'S NEW FOUND POWER. (MIKE)>> TOO BAD WE DON'T HAVE A THROTTLE. STEERING RESPONSE, IT'S ALSO ADJUSTABLE FOR THE GT'S HANDLING DYNAMICS. THE UPPER STRUT MOUNTS ARE THE SAME USED ON THE GT 500, AND MADE TO ELIMINATE THE POPPING NOISE YOU OFTEN GET FROM A LOWERED VEHICLE. FINALLY THE STRUT TOWER BRACE FROM OUR HANDLING KIT WILL REDUCE CHASSIS FLEX DURING CORNERING AND COMPLIMENT THE SWAY BAR. 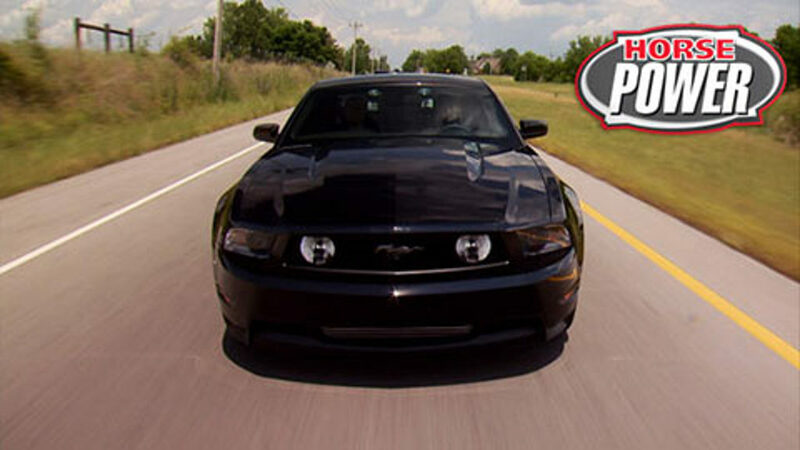 A MUSTANG WITH THIS MUCH POWER AND IMPROVED HANDLING NEEDS THE BEST POSSIBLE BRAKING SYSTEM. SO WHILE WE'RE REUSING THE CALIPERS, THE STOCK ROTORS ARE COMING OFF TO GET REPLACED WITH EBC SPORT ROTORS. THEY'RE DIMPLED AND SLOTTED FOR BETTER PERFORMANCE AND LOW NOISE. YOU'VE SEEN US USE A LOT OF EBC BRAKE PADS HERE ON THE POWERBLOCK ON VARIOUS VEHICLES. THEY'RE DESIGNED FOR QUIET OPERATION AND ALL OF THEM BUT THIS RACE PAD HAVE A SPECIAL BREAK IN COATING. 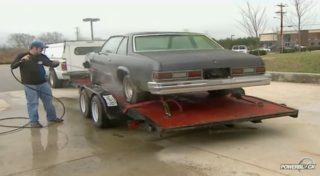 THEY ALSO COME IN A LOT OF COLORS, WHICH RELATES PRIMARILY TO THEIR PRICING, WHAT THEY'RE MADE OF, AND MAINLY THE PURPOSE OF THE VEHICLE THEY'RE GOING ON. FOR EXAMPLE, THEIR BASIC ULTIMAX PAD IS A STOCK REPLACEMENT DESIGNED FOR USE WITH THEIR STOCK REPLACEMENT ROTORS. GREEN STUFF'S AN IMPROVED STREET PAD WITH 30 PERCENT LESS DUST THAN STOCK. RED'S A TRUE PERFORMANCE PAD WITH 80 PERCENT LESS DUST THAN STOCK. 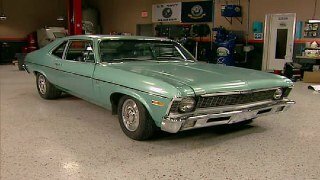 (JOE)>> REMEMBER, THE COYOTE ROLLED IN WITH 370 AT THE REAR WHEELS, AND AFTER SEVERAL RUNS LOOKS LIKE WE'RE AT 471, A GAIN OF 101 HORSEPOWER. AND JUST THINK, WE GOT THAT 471 HORSEPOWER WITH A BASIC PAXTON TUNE. IMPRESSIVE ABOUT IT. 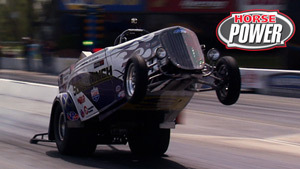 DURING WIDE OPEN THROTTLE WE SAW AIR FUELS BETWEEN 10.8 AND 11.1, LETTING US KNOW THAT'S A SUPER SAFE DAILY DRIVER TUNE. GREAT HANDLING, GREAT POWER, DUMP THE CLUTCH AND GET READY TO KNOCK YOUR REAR TIRES LOOSE, AND DO SO AS LONG AS YOU WANT. (JOHN)>> ALRIGHT, I'M PAYING ATTENTION NOW, WHOA! 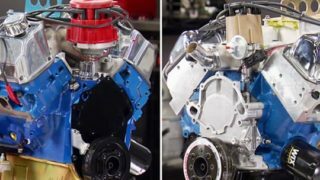 (JOE)>> IT DOESN'T TAKE AN EXPERT ENGINE BUILDER TO UNDERSTAND WHY YOU GET MORE STRENGTH AND DURABILITY FROM FOUR BOLT MAINS ON YOUR HIGH PERFORMANCE ENGINE BLOCK COMPARED TO TWO BOLT MAINS. RECENTLY WE SHOWED YOU HOW TO CONVERT A TWO BOLT MAIN BLOCK TO FOUR BOLT BY FIRST HAVING A MACHINIST DRILL EXTRA BOLT HOLES. THEN ADDING A NEW SET OF MILODON BILLET SPLAYED CAPS. THAT WAS FOLLOWED BY LINE BORING TO GET THE CAPS BORED CLOSE BEFORE A FINAL LINE HONE. 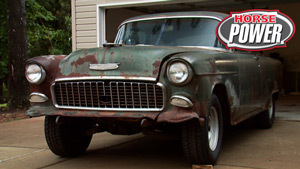 (JOHN)>> NOW ALL THAT CAN COST OVER $400 DOLLARS, DEPENDING ON YOUR APPLICATION AND THE AVAILABILITY OF PARTS. SO HERE'S A CHEAPER, MORE COST EFFECTIVE WAY TO ADD STRENGTH TO YOUR BLOCK BY CONVERTING THESE FACTORY STYLE BOLTS TO AN ARP STUD. SINCE THE BOLT INSTALLS DIFFERENTLY, IT'S GONNA GIVE A DIFFERENT GAUGE READING. WHY ARE STUD'S BETTER THAN BOLTS FOR YOUR MAIN CAPS? WELL CONSIDER THIS, A BOLT HAS TWO COURSES OF FRICTION WHEN IT'S SNUGGED DOWN. FIRST THE THREADS STRETCH FOR A CLAMPING FORCE, AND THAT'S GOOD, BUT IN ADDITION IT ALSO TWISTED AS YOU TORQUE IT. A STUD IS ONLY INSTALLED FINGER TIGHT. WHEN THE NUT DRAWS DOWN ON IT, IT ONLY PULLS ON ITS LINEAR AXIS. THIS MAKES FOR BETTER TORQUING AND A MUST STRONGER FASTENER. (JOE)>> NOW REINSTALL THE CAP, THEN THE WASHERS AND NUTS, AND DON'T BE STINGY WITH THAT ULTRA LUBE. NEXT YOU CAN TORQUE THEM DOWN IN SPEC. (JOHN S.)>> WITH THESE ARP STUDS, THE HOUSING BORE CLOSED UP ABOUT FOUR TENTHS TO A HALF A THOUSANDTHS. (JOHN)>> HERE'S A CRITICAL FOLLOW UP TO THE SWAP. TOUCHING UP THE LINE HONE AT YOUR MACHINE SHOP TO MAKE SURE EVERYTHING'S BACK IN ROUND. THIS INSURES THERE'S NO BIND OR UNWANTED FRICTION ON THE CRANK SHAFT. NOW WE'RE BACK ROUND TO SIZE AGAIN. HEY THANKS FOR YOUR HELP TODAY JOHN. NOW BEST CASE SCENARIO IF YOU DIDN'T TOUCH UP THE HONE, LOCK UP THE CRANK SHAFT WHILE YOU'RE ASSEMBLING IT JUST TO FIND OUT YOU'VE GOT TO GO TO THE MACHINE SHOP. (JOE)>> YEAH BUT THE WORST CASE SCENARIO IS IT SEEMS FINE UNTIL YOU MAKE THAT FIRST PASS AT THE TRACK AND WELL, COMES UNGLUED AND THAT'S GONNA REALLY COST YOU. (JOHN)>> SO WITH THE PRICE OF THE STUDS AND THE LINE HONE, ONLY SET US BACK ABOUT $150 DOLLARS. AND UNLESS YOU'VE GOT DEEP JOE ELMORE POCKETS, IT'S DEFINITELY AN IDEAL WAY TO BEEF UP YOUR BOTTOM END WITHOUT LEANING OUT YOUR BANK ACCOUNT. 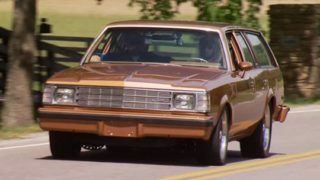 (MIKE)>> TODAY'S SHOW HAS BEEN ALL ABOUT THE NEW FIVE LITER MUSTANG, BUT IF YOU'VE GOT A '65 THROUGH '73 MODEL OR EVEN A FOX BODY, AMERICAN POWERTRAIN'S GOT SEVERAL PARTS UPGRADES WITH YOU IN MIND, LIKE THEIR NEW XFACTOR TRANSMISSION CROSS MEMBERS. THE BLUE ONE HERE IS FOR YOUR EARLY MODEL, THE SILVER ONE FOR ALL YOUR FOX BODIES, TO THIS, THE NEW HYDROMAX HYDRAULIC RELEASE BEARING FOR FORDS. NOW THIS THING FEATURES A FLOATING STUD MOUNT FOR EASY INSTALLATION AS WELL AS AN INTEGRATED STOP TO PREVENT ANY KIND OF OVER STROKING. 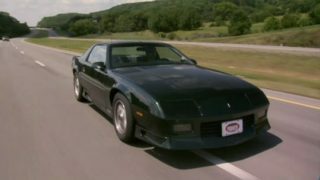 NOW IT'LL WORK WITH YOUR PREEXISTING THREE QUARTER OR SEVENEIGHTHS BORE MASTER CYLINDER AND IT'S MADE FOR PRETTY MUCH ANY TYPE OF TREMEC TOP LOADER. LOG ON AND GO TO AMERICAN POWERTRAIN DOT COM. THAN THE STOCK COIL FOR MORE EFFICIENT BURN RATE. THIS YELLOW BODY'S MOLDED WITH A HIGH DIALECTIC STRENGTH MATERIAL, AND INSIDE ARE HIGH TEMP EPOXIES TO RESIST SHOCK AND VIBRATION. THIS LITTLE GUY'S A DIRECT BOLT ON, AND IT EVEN FITS THE F-150 TRUCKS. YOU CAN GET A BOX OF EIGHT FOR ABOUT $450 BUCKS. WELL TIME FLIES WHEN YOU'RE HAVING FUN MAKING HORSEPOWER. WE'RE GONE FOR NOW, SEE YOU NEXT TIME.